Google working on AirPlay for Android | What Hi-Fi? Google is working on its own version of AirPlay that would allow you to stream audio and video content between Android phones, smart TVs and other networked devices. Apple has long had the a perceived advantage with AirPlay, which allows simple audio and video streaming from one Apple product to another, and now Google wants a piece of the action. Despite Bluetooth, for audio, and DLNA, for video, offering similar functionality for non-Apple products, the lack of a universally adopted and marketed standard is something Google is rumoured to be looking to rectify. First, Google announced its own version of AirPlay for Google TV, allowing any Android phone to send videos to a Google TV without any further set-up needed. 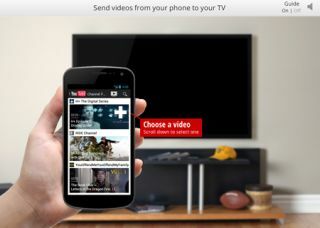 Then, a newly released version of YouTube designed especially for Google TV was unveiled last week, highlighting the ability to stream and remote control content directly from your phone to your TV. Google wants to bring this functionality to more devices and more software, not just Google TV boxes or the YouTube app. GigaOm reports Google product manager, Timbo Drayson, saying Google is "actively working with other companies" to make this YouTube Google TV feature a wider industry standard. Google's version of AirPlay would also allow content to flow both ways, allowing you to stream from your phone to TV and from your TV to phone, for example. This would allow for a complete second screen experience. DLNA is available on hundreds of devices and has been for some years but many manufacturer's choose to rebrand the feature – Samsung's AllShare and LG's SmartShare – which arguably muddies the waters for consumers, while some devices offer different levels of DLNA functionality to others.